We want to start by saying yesterday was one of the best days we’ve had as a band, for many reasons. The familiar faces we saw there, the many new faces who enjoyed and supported the day, it was a pleasure to play in front of you all and to chat with you after. Each and every band that we had a real pleasure meeting and sharing the stage with and being mesmerised by watching. 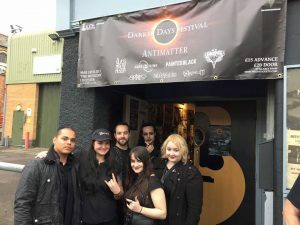 To all the great staff at The Musician and saving the best to last, to Angela for all your hard work in creating such an incredible day that was Darker Days Festival. Thank you again for having us part of it and put simply, just being an awesome person! We’ll miss our sister a great deal and wish her all the best in everything she’s planning going forward in and out of music. We’ve had some great times over the years, ever since the first time meeting her one cold night in Camden. We know she’ll continue to do great things and are so glad to have had yesterday as the stage to share as our last together. As for Orpheum, we’ll be back soon with news of what we have planned next. Watch this space…. 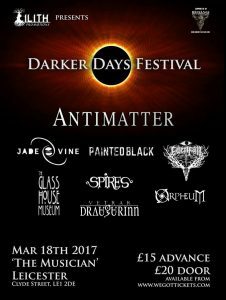 We’re just over one week until the Darker Days Festival in Leicester on Saturday 18th March, which will be headlined by Antimatter and includes Vetrar Draugurinn’s first UK show; featuring an ex Stream of Passion member. We’ll see you there for what we know will be one special day!